The life of bathroom surfaces, whether new or re-enamelled, can be extended by many years if specific care is taken during cleaning and maintenance. The care taken in cleaning these surfaces will keep them looking new and shiny for many years. Need a Professional Bathroom Surface Clean? Has your bathroom been damaged or neglected and needs a professional to get it clean and looking like new again? 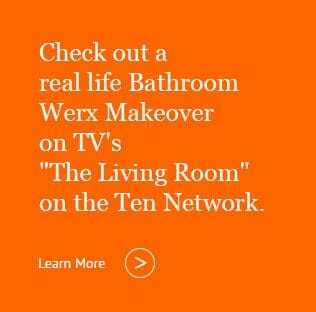 Bathroom Werx' detailing service can come to your rescue! We offer after-sales advice of how to extend the life of your bathroom enamel resurfacing as well as a professional bathroom cleaning service. In some areas domestic water contains unacceptably high proportions of "foreign objects" which in time may either stain or scratch most surfaces. Contaminants such as vegetable colloids and iron oxide will stain the surface. Even new bathroom surfaces are often stained as well. In areas where the water contains a lot of lime, a sediment often builds up around the waste, below the taps, etc. It is important to ensure that dripping taps are attended to and not to allow water to remain on bathroom surfaces. Damage caused by dripping taps over a period of time causes considerable damage to bathroom surfaces. Not only does it waste water, but it eventually breaks down the surface of the bath or basin. We have seen many baths and basins worn right through the enamel below the dripping taps. The first sign of damage is the staining of the enamel surface. This stain is usually green or faint brown. Often dripping taps eventually cause rust around an outlet. If the bath or basin is re-enamelled and the taps continue to leak, rust will re-occur. Many soaps contain caustic soda which, in time, bleach many enamel pigments. Soap should not be allowed to stand on a bare enamel surface for a protracted period of time. The use of soap rests or soap dishes is strongly recommended. Poorly installed wastes can lead to water lying around the waste and not draining properly. Water left to sit there will eventually lead to corrosion. In acrylic and fibreglass baths the effect of water will often stain the surface therefore requiring severe cleaning methods which often remove the shine and can damage the surface. The dyes and residues from clothing left to soak in a bathtub or basin can stain the surface. This can be difficult to remove and with acrylic and fibreglass baths can lead to the stains impregnating the surface. Strong detergents in washing powders will eventually cause damage. Soaking washing in a bath or basin will eventually stain and discolour the surface. Poor installation of bathroom fittings can lead to water pooling on bathroom surfaces. Water left to stand on bare enamel surfaces for a long period of time will eventually cause damage. This is often the same damage caused by a dripping tap. With the level of chemicals put into our water supply today, it would only add to this concern. Another reason for rust appearing around the outlet is water unable to drain away and just sitting there. Correct installation of acrylic and fibreglass bathtubs is critical as severe flexing may result in the bathtub cracking. Cigarettes can seriously damage many types of baths and basins and benchtops, especially acrylic and fibreglass surfaces. Although most surfaces can be repaired economically, some damage is costly. Vitreous enamel surfaces are not easily damaged by cigarette burns. Nail varnish often leaves marks on bathroom surfaces. Nail varnish remover contains solvents which may cause damage to some fibreglass and acrylic baths. Things dropping off shelves or window sills above a bath or basin. Children's hard bath toys (e.g. metal cars). It is important to attend to damage as soon as possible to prevent further deterioration. Please note that damage caused by chipping is not covered by the Bathroom Werx guarantee. Bathroom Werx offers a chip repair service which includes colour matching the area as well. 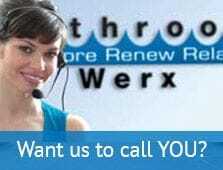 Call a Bathroom Werx office near you for more information about this service. Extremely hot water causes any surface to expand and contract. Sudden changes in temperature can cause cracks and other damage. It is advisable to periodic ally check the temperature of the hot water. A temperature not exceeding 65 degrees Centigrade is recommended. Always turn the cold water tap first and slowly turn on the hot water tap to gradually increase the temperature of the water. This is an important procedure to follow especially if you have a polymarble basin top as it helps to prevent crazing in these surfaces which is caused by sudden changes in temperature. Hair dyes contain very powerful chemicals which will stain most bathroom surfaces. It is advisable not to use hair dyes in any bathtub but rather in porcelain hand basins which are far more chemical and stain resistant. It is unhygienic to leave bath mats in the bath or shower. Always remove the mat after use. Mats left to sit are great places for water to get captured and just sit there for long periods of time and their suction cups harbour bacteria, mould and mildew. Water left to stand on resurfaced areas for a long period of time will eventually cause damage. Stick-on non-slip strips can cause problems when the edges start to lift off, and depending on the method of removal, can damage the surface. Once the edges have lifted, they are also unhygienic. The frequent use of deeply coloured substances such as bubble baths and bath oils could also permanently discolour most surfaces. The constant use of coloured disinfectants and soaps can result in a stained residue build up on bathroom surfaces which can only be removed with a specialised polishing process. In some cases the stain penetrates the surface and cannot be removed. There are a few unavoidable causes for bathroom surface deterioration. The most common of these is the supply of discoloured water which often leaves a yellowish brown stain. Unfortunately, bathroom surfaces in these areas will show rapid signs of staining and discolouring, especially below dripping taps. Bathroom Werx offers a specially developed cleaning product for the Werx Enamel. The Werx Bathtub and Tile Cleaner contains a disinfectant to kill harmful bacteria which can thrive in the moist conditions of your bathroom, and is designed to maintain the high gloss appearance of your re-enamelled fixtures and fittings. It is recommended to use The Werx Bathtub and Tile Cleaner according to the recommended cleaning prodecures below. BUY 6 FOR ONLY $60.00* (incl.GST) - Save $30.00!!! The best time to clean your bathroom surfaces is immediately after use while the dirt is still soft. Only use a sponge or soft cloth for cleaning. This, in combination with a soft liquid (non-abrasive) soap or detergent, are all that is needed to get the above Sanitaryware items 100% clean. Rinse the surface well with clean water and finish the cleaning process off by making sure the surface is completely dry. An effective way to remove the build up of body oils combined with soap and shampoo (appears as yellow staining) on a bath, shower base or wall tiles, is to use Bathroom Werx Cleaner on a soft cloth to clean the surface. For example you will find that the ring around a bathtub which is just a combination of body fats and soap, will dissolve easily with our Cleaner without scrubbing and will not harm the surface. Use the same technique to clean tiles, shower screens, basins, exterior of toilets, toilet cisterns even chrome or gold plated tapware and outlets. If you use a bath mat, always remove immediately after use - never let it remain in the bath as it will damage the enamel. Do not hang the bath mat (or wet towels) over the bath to dry. Bathroom Werx have specially formulated a Cleaner for cleaning the new enamel on re-enamelled surfaced areas. It contains a disinfectant to kill any germs; a polishing compound to maintain the shine on your new surfaces, and a lanolin to care for your hands. The greatest area of abuse occurs in the cleaning process. Never use steel wool, abrasive pads or applicators on a re-enamelled area. These will cause immediate damage to most bathroom surfaces. Never use abrasive substances. It is very tempting to try to remove marks with these substances but greater damage is always the end result. The most important substances to avoid are abrasive powders and cremes. Considerable damage can also be done by using acids or other chemical substances such as drain cleaners. Of these chlorine, pool acid, bleach, vinegar, toilet cleaner and lemon juice must strictly be avoided. Most of these substances will remove stains but the surface glaze layer will also be permanently damaged in the process. The damage that these products do can be described as follows. They clean the surface by "scratch" cleaning the dirt off. This leaves tiny scratches on the surface, which get filled with dirt. So you scrub harder to clean them off, creating more scratch marks. Each time you clean it will become harder to clean satisfactorily. This cycle eventually leads to a complete break down of the surface.